My food blogger buddy Shannon over at Delectalicious! gave me this award this week! Thanks so much Shannon. This totally made my day/week/month/year! I really do enjoy blogging all about what I cook up in our kitchen each week, although it is a lot of extra work on my plate. I have a passion for cooking and baking and want to share it with the world! Now that I made it through Thanksgiving, it's time to move towards Christmas. That means lots of warm, comforting winter meals and tons of baked goodies. I'm so thankful for Shannon and my other loyal followers for sticking with me. I've been inspired by many other bloggers and hope to inspire others too. 3. Pay it forward to 15 recently discovered great bloggers. 4. 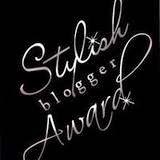 Contact those bloggers and tell them about their award. 1. My family is my #1 priority and my life will always revolve around my 3 beautiful girls and awesome husband. We also have 2 sweet lab puppy dogs in our family, Dakota and Kodiak. 2. I was born in Tulsa, Oklahoma in 1972 (yes, I'm nearing the 40 year mark quickly), but call Texas my home since my Mom and I moved here in 1978. I can't imagine living anywhere else but Texas. 3. My husband and I went to high school together and have been friends since the 7th grade. We started dating in our college years and have been inseparable ever since. We celebrated our 12 year anniversary this year. 4. My Mom and Mother-in law are my 2 best women friends. I don't know what I would do without them! They are the best! 5. I love love love to travel. I prefer tropical vacations over any other. My favorite vacation spot is in and around Cancun, Mexico. The beaches are amazing! I dream of visiting Hawaii. 6. I'm a Food Network and Cooking Channel junkie. I can't get enough. My waist line has had enough though! 7. I have been a SAHM (stay at home mom) for 8 years and love it! Please come by and check them out. I have been inspired by these great people and I'm sure you will be too! And don't forget to check out Shannon's blog too! Have a great weekend. I'm from Hawaii and it is beautiful. I really hope you make it there someday. I'm also a Food Network junkie. I just can't get enough of Alton Brown and the Iron Chef. I am HONOURED to have been included in such amazing company!!! Thank you so very much for the Award! That is so very sweet you thought of me! Thank you so much for the award! My first one! I havent had a chance to do anything with it yet but I will this coming up week! Promise! Hope you and your fam had a wonderful Thanksgiving and weekend! Thank you so much!! You are so sweet!